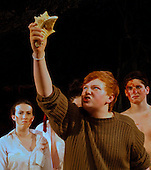 Yvonne Arnaud Youth Theatre rehearsing "Lord of the Flies", Guildford. © Education Photos |CONTACT |All photos are copyright the respective photographer. Please, do not copy without permission.